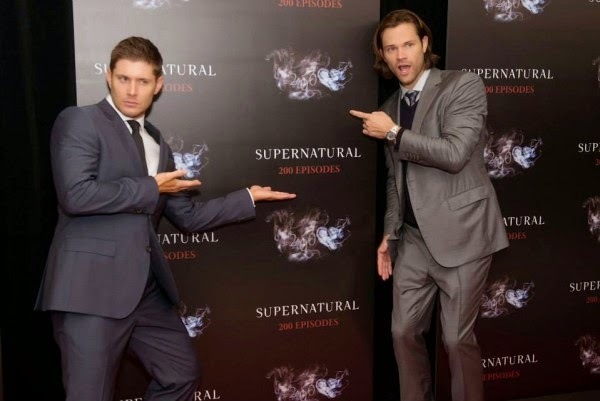 The Supernatural team is celebrating the 200th episode with a special musical 'fan fiction' on November 11 on The CW. The Supernatural season 10 will take a break this week and no new episode will be aired this Tuesday, 4 November. According to official synopsis of episode 5, "When Sam (Jared Padalecki) and Dean (Jensen Ackles) investigate the disappearance of a teacher, they are stunned to see the school is putting on a musical based on their lives. Familiar faces abound in this milestone episode"
This episode will be the biggest challenge for the Winchester brothers, and going by the promos Dean is not happy with all the singing and merriment. Executive producer Jeremy Carver previewed and teased more on the special episode. He told IGN: "I think one of the fun things about the episode is that because they might be going to a play, you're going to see representations in a lot of different ways of a lot of our favourite characters. So, characters we might expect to see will be represented in many different ways. "It's very much a love letter not only to the fans but to some of the actors that have graced the screen on the show over the years. There's going to be lots of little easter eggs of sorts with little, visual shout-outs to folks we've grown to love from the past," he continued. In July, Jeremy Carver told E Online: "We're going pretty meta. I would just describe it as something of a love letter to our fans and there will be songs." While he also confirmed that there would be more than one song in the episode, he laughed when asked whether we would see Jared and Jensen sing a few tunes. Either way, get ready for a whacky and wonderful Supernatural installment. Jensen Ackles and Jared Padalecki attended Supernatural 200th Episode Celebration held at the Fairmont Pacific Rim Hotel in Vancouver, Canada. The on-screen brothers were joined by their co-stars Misha Collins and Felicia Day, as well as their wives Danneel Ackles and Genevieve Cortese. "Earlier someone asked me if season 10 was it and my only answer was, 'I hope not. But if it is, it's something to be proud of, and if it's not, we'll carry on,'" Jared recently told JustJared. "I feel like season eight and nine, specifically, we caught a second wind. We had new storylines and new characters who brought such life to it. As a fan of the show, I've been excited an uptick in the quality of the show. They're creating new and fun things, and if they keep doing that, we'll see." Watch the 200th episode promo here.